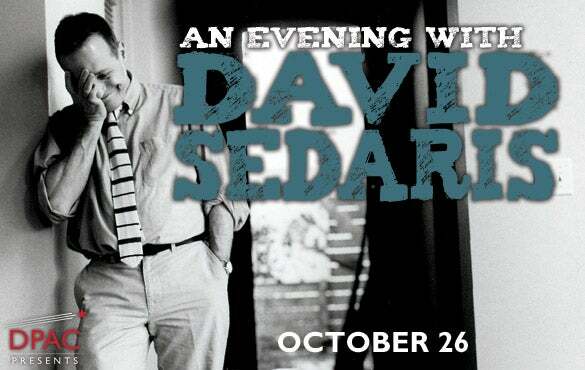 June 6, 2012 (Durham, NC) — David Sedaris, author of the previous bestsellers Naked, Me Talk Pretty One Day, Dress Your Family in Corduroy and Denim, and regular National Public Radio contributor will be appearing for one night only at the Durham Performing Arts Center on Friday, October 26 at 8:00pm. Celebrating the release of his new title, Squirrel Seeks Chipmunk: A Modest Bestiary, a book of acerbic, outrageously funny fables, featuring animals with unmistakably human failings, which hit bookstores September 2010, author David Sedaris will visit Durham for an evening of engaging recollections and featuring all-new readings. Tweaking the familiar until it warps; David Sedaris mines poignant comedy from his peculiar childhood in North Carolina, his bizarre career path, and his move with his lover to France. Including his last release, the New York Times #1 Bestselling book, When You Are Engulfed in Flames, David Sedaris’ wickedly witty observations of the ordinary-bizarre is always sure to deliver insights and laughs. One of six children in a second-generation Greek family, he grew up in Raleigh, North Carolina. In 1977, he dropped out of Kent State University to hitchhike around the country. Aside from working as an elf, Sedaris has worked a number of charmingly quirky jobs such as a house painter, an apple picker, an aide in a mental hospital, a creative writing teacher at the Art Institute of Chicago, and an apartment cleaner. Sedaris made his comic debut recounting his strange-but-true experiences of being a Macy’s elf, reading his “Santaland Diaries” on National Public Radio’s Morning Edition in 1992. His sardonic humor and incisive social critique have made him one of NPR’s most popular and humorous commentators. In 2001, he was named Humorist of the Year by Time magazine and received the Thurber Prize for American Humor. Tickets go on sale to the public beginning Friday, June 15 at 10am. Ticket prices range from $40-$55 and are available in person at DPAC Ticket Center and all Ticketmaster Outlets, by phone at 919-680-2787 and 800-745-3000, or online at DPACnc.com or Ticketmaster.com.